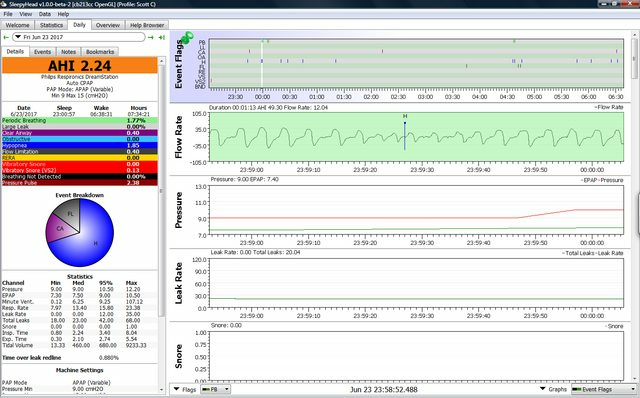 This may help you see how they titrate cpap in the labs, for a better background understanding on adjustment. With an auto, This would refer to the min pressure setting. The high is always a couple of cm above the 95% or max. page 33 of the document. Thanks ajack. I think I get it now. So i guess Ill shot for 10 min. pressure and see how it goes tonight. Wont mess with the Flex for now. 9 is fine, you may need 10 for a bad night, it will be obvious if you do. when the AHI numbers are down more, you can zoom in on the hypopnea and see if there are events before it, like a few deep breaths, or there is no real drop in average tidal volume. It's a high followed by a low to keep the O2 level. The machine can falsely tag some events. 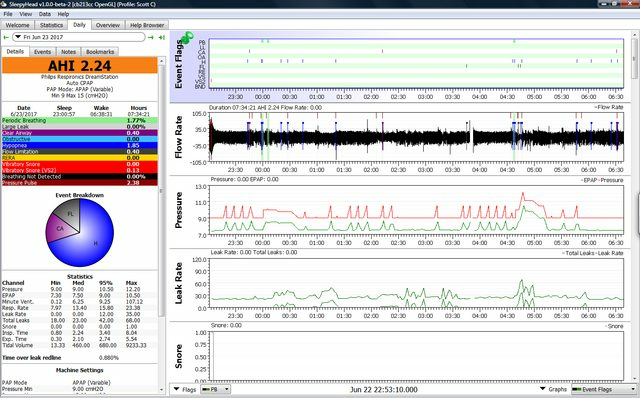 sleepyhead doesn't have all the data a sleep lab has. we don't have o2 desaturation data to confirm it. I still had a few H tagged, but on inspection, only a couple I would call real. You might like to post the zoomed in section, sleeprider is very good at deciphering them. O.K. 9 it is. Thanks for all the info ajack . I will do a zoom in on a hypopnea when they get lower in number. What should I be shooting for? On another note, it looks to me I have a leak issue. Is trying tape a good idea to figure it out? you could start looking now, to see the difference between the events tagged as H. put up some zoomed in pics. Other things to look for is how low did the tidal volume go, was there recovery breaths after the event. etc. I would search old threads, because they normally have a problem, followed by a solution that worked. It's where I got my best understanding. Which graphs should I zoom in on? Have read some of Bonjaur's stuff. Thats were I read about taping the mouth. Here is last nights chart, with min. pressure was at 9. CAs went up and 95% pressure went to 10.5 and the P.B. went up also . Should I be concerned ? He would be referring to the flow rate graph, zoom into the point where you can see the individual breaths surrounding a hypopnea event. A full face could be an option if you can't get the leaks resolved another way. When you raised your pressure the last time your CA's went up, then came back down the next night. I would let this be for a few nights and settle into your new settings and keep and eye on the CA,s. In the end of the day, you will probably decide to go a little higher. Thanks Dave and" ajack". here is a close-up of a Hypopnea from last night. I guess I'll hold off on any more setting changes to see if everything settles down.